Cell culture is the process by which cells are grown under controlled conditions, generally outside of their natural environment. 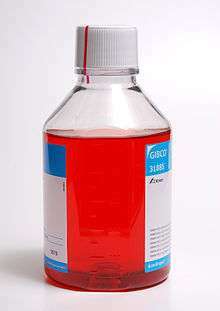 Cell culture conditions can vary for each cell type, but artificial environments consist of a suitable vessel with substrate or medium that supplies the essential nutrients (amino acids, carbohydrates, vitamins, minerals), growth factors, hormones, and gases (CO2, O2), and regulates the physio-chemical environment (pH buffer, osmotic pressure, temperature). Most cells require a surface or an artificial substrate (adherent or monolayer culture) whereas others can be grown free floating in culture medium (suspension culture). The 19th-century English physiologist Sydney Ringer developed salt solutions containing the chlorides of sodium, potassium, calcium and magnesium suitable for maintaining the beating of an isolated animal heart outside of the body. In 1885, Wilhelm Roux removed a portion of the medullary plate of an embryonic chicken and maintained it in a warm saline solution for several days, establishing the principle of tissue culture. Ross Granville Harrison, working at Johns Hopkins Medical School and then at Yale University, published results of his experiments from 1907 to 1910, establishing the methodology of tissue culture. Balanced salt solution It is an isotonic mixture of ions to act as cofactors for enzymatic reactions, cell adhesion etc. Phenol red dye pH indicator. The color of phenol red changes from orange/red at pH 7-7.4 to yellow at acidic(lower) pH and purple at basic (higher) pH. For more details on this topic, see Hybridoma. Cell culture is also a key technique for cellular agriculture, which aims to provide both new products and new ways of producing existing agricultural products like milk, (cultured) meat, fragrances, and rhino horn from cells and microorganisms. It is therefore considered one means of achieving animal-free agriculture. Cell culture in three dimensions has been touted as "Biology's New Dimension". At present, the practice of cell culture remains based on varying combinations of single or multiple cell structures in 2D. Currently, there is an increase in use of 3D cell cultures in research areas including drug discovery, cancer biology, regenerative medicine and basic life science research. There are a variety of platforms used to facilitate the growth of three-dimensional cellular structures including scaffold systems such as hydrogel matrices and solid scaffolds, and scaffold-free systems such as low-adhesion plates, nanoparticle facilitated magnetic levitation, and hanging drop plates. ↑ "Whonamedit - Ringer's solution". whonamedit.com. Retrieved 2014-06-09. ↑ "Animals and alternatives in testing". Archived from the original on 2006-02-25. Retrieved 2006-04-19. ↑ Schiff, JudithAnn. "An unsung hero of medical research". Retrieved 2006-04-19. Yale Alumni Magazine, February 2002. ↑ "Post - Blog | Boval BioSolutions, LLC". bovalco.com. Retrieved 2014-12-02. ↑ Portela VM, Zamberlam G, Price CA (April 2010). "Cell plating density alters the ratio of estrogenic to progestagenic enzyme gene expression in cultured granulosa cells". Fertil. Steril. 93 (6): 2050–5. doi:10.1016/j.fertnstert.2009.01.151. PMID 19324349. ↑ Jill Neimark (27 February 2015). "Line of attack". Science. 347 (6225): 938–940. doi:10.1126/science.347.6225.938. ↑ Drexler, HG; Dirks, WG; MacLeod, RA (Oct 1999). "False human hematopoietic cell lines: cross-contaminations and misinterpretations". Leukemia. 13 (10): 1601–7. doi:10.1038/sj/leu/2401510. ISSN 0887-6924. PMID 10516762. ↑ Drexler, HG; MacLeod, RA; Dirks, WG (Dec 2001). "Cross-contamination: HS-Sultan is not a myeloma but a Burkitt lymphoma cell line" (Free full text). Blood. 98 (12): 3495–6. doi:10.1182/blood.V98.12.3495. ISSN 0006-4971. PMID 11732505. ↑ Cabrera, CM; Cobo, F; Nieto, A; Cortés, JL; Montes, RM; Catalina, P; Concha, A (Jun 2006). "Identity tests: determination of cell line cross-contamination". Cytotechnology. 51 (2): 45–50. doi:10.1007/s10616-006-9013-8. ISSN 0920-9069. PMC 3449683 . PMID 19002894. 1 2 Chatterjee, R (Feb 2007). "Cell biology. Cases of mistaken identity". Science. 315 (5814): 928–31. doi:10.1126/science.315.5814.928. ISSN 0036-8075. PMID 17303729. ↑ Liscovitch, M; Ravid, D (Jan 2007). "A case study in misidentification of cancer cell lines: MCF-7/AdrR cells (re-designated NCI/ADR-RES) are derived from OVCAR-8 human ovarian carcinoma cells". Cancer Letters. 245 (1–2): 350–2. doi:10.1016/j.canlet.2006.01.013. ISSN 0304-3835. PMID 16504380. ↑ Macleod, RA; Dirks, WG; Matsuo, Y; Kaufmann, M; Milch, H; Drexler, HG (Nov 1999). "Widespread intraspecies cross-contamination of human tumor cell lines arising at source". International Journal of Cancer. Journal International Du Cancer. 83 (4): 555–63. doi:10.1002/(SICI)1097-0215(19991112)83:4<555::AID-IJC19>3.0.CO;2-2. ISSN 0020-7136. PMID 10508494. ↑ Masters, JR (Apr 2002). "HeLa cells 50 years on: the good, the bad and the ugly". Nature reviews. Cancer. 2 (4): 315–9. doi:10.1038/nrc775. ISSN 1474-175X. PMID 12001993. 1 2 Dunham, J.H. ; Guthmiller, P. (2008). "Doing good science: Authenticating cell line identity" (PDF). Cell Notes. 22: 15–17. ↑ Nguyen, H. T.; Geens, M.; Spits, C. (2012). "Genetic and epigenetic instability in human pluripotent stem cells". Human Reproduction Update. 19 (2): 187–205. doi:10.1093/humupd/dms048. PMID 23223511. ↑ "Moore v. Regents of University of California (1990) 51 C3d 120". Online.ceb.com. Retrieved 2012-01-27. ↑ Hayflick, L. (September 1998). "A brief history of the mortality and immortality of cultured cells". Keio J Med. 3. 47 (3): 174–182. doi:10.2302/kjm.47.174. PMID 9785764. ↑ "Worthington tissue guide". Retrieved 2013-04-30. ↑ Qiana L, Saltzman WM (2004) "Improving the expansion and neuronal differentiation of mesenchymal stem cells through culture surface modification." Biomaterials 25: 1331-1337. ↑ Discher, D. E.; Janmey, P; Wang, YL (2005). "Tissue Cells Feel and Respond to the Stiffness of Their Substrate". Science. 310 (5751): 1139–43. doi:10.1126/science.1116995. PMID 16293750. ↑ Gilbert, PM; Havenstrite, KL; Magnusson, KE; Sacco, A; Leonardi, NA; Kraft, P; Nguyen, NK; Thrun, S; Lutolf, MP; Blau, HM (2010). "Substrate elasticity regulates skeletal muscle stem cell self-renewal in culture". Science. 329 (5995): 1078–81. doi:10.1126/science.1191035. PMC 2929271 . PMID 20647425. ↑ Chowdhury, Farhan; Li, Yanzhen; Poh, Yeh-Chuin; Yokohama-Tamaki, Tamaki; Wang, Ning; Tanaka, Tetsuya S. (2010). Zhou, Zhongjun, ed. "Soft Substrates Promote Homogeneous Self-Renewal of Embryonic Stem Cells via Downregulating Cell-Matrix Tractions". PLoS ONE. 5 (12): e15655. doi:10.1371/journal.pone.0015655. PMC 3001487 . PMID 21179449. ↑ Engler, Adam J.; Sen, Shamik; Sweeney, H. Lee; Discher, Dennis E. (2006). "Matrix Elasticity Directs Stem Cell Lineage Specification". Cell. 126 (4): 677–89. doi:10.1016/j.cell.2006.06.044. PMID 16923388. ↑ Paszek, Matthew J.; Zahir, Nastaran; Johnson, Kandice R.; Lakins, Johnathon N.; Rozenberg, Gabriela I.; Gefen, Amit; Reinhart-King, Cynthia A.; Margulies, Susan S.; Dembo, Micah; Boettiger, David; Hammer, Daniel A.; Weaver, Valerie M. (2005). "Tensional homeostasis and the malignant phenotype". Cancer Cell. 8 (3): 241–54. doi:10.1016/j.ccr.2005.08.010. PMID 16169468. ↑ Levental, Kandice R.; Yu, Hongmei; Kass, Laura; Lakins, Johnathon N.; Egeblad, Mikala; Erler, Janine T.; Fong, Sheri F.T. ; Csiszar, Katalin; Giaccia, Amato; Weninger, Wolfgang; Yamauchi, Mitsuo; Gasser, David L.; Weaver, Valerie M. (2009). "Matrix Crosslinking Forces Tumor Progression by Enhancing Integrin Signaling". Cell. 139 (5): 891–906. doi:10.1016/j.cell.2009.10.027. PMC 2788004 . PMID 19931152. ↑ Tilghman, Robert W.; Cowan, Catharine R.; Mih, Justin D.; Koryakina, Yulia; Gioeli, Daniel; Slack-Davis, Jill K.; Blackman, Brett R.; Tschumperlin, Daniel J.; Parsons, J. Thomas (2010). Hotchin, Neil A, ed. "Matrix Rigidity Regulates Cancer Cell Growth and Cellular Phenotype". PLoS ONE. 5 (9): e12905. doi:10.1371/journal.pone.0012905. PMC 2944843 . PMID 20886123. ↑ Liu, F; Mih, JD; Shea, BS; Kho, AT; Sharif, AS; Tager, AM; Tschumperlin, DJ (2010). "Feedback amplification of fibrosis through matrix stiffening and COX-2 suppression". The Journal of Cell Biology. 190 (4): 693–706. doi:10.1083/jcb.201004082. PMC 2928007 . PMID 20733059. ↑ Wipff, PJ; Rifkin, DB; Meister, JJ; Hinz, B (2007). "Myofibroblast contraction activates latent TGF-beta1 from the extracellular matrix". The Journal of Cell Biology. 179 (6): 1311–23. doi:10.1083/jcb.200704042. PMC 2140013 . PMID 18086923. ↑ Georges, PC; Hui, JJ; Gombos, Z; McCormick, ME; Wang, AY; Uemura, M; Mick, R; Janmey, PA; Furth, EE; Wells, RG (2007). "Increased stiffness of the rat liver precedes matrix deposition: Implications for fibrosis". American Journal of Physiology. Gastrointestinal and Liver Physiology. 293 (6): G1147–54. doi:10.1152/ajpgi.00032.2007. PMID 17932231. ↑ Li, L; Sharma, N; Chippada, U; Jiang, X; Schloss, R; Yarmush, ML; Langrana, NA (2008). "Functional modulation of ES-derived hepatocyte lineage cells via substrate compliance alteration". Annals of Biomedical Engineering. 36 (5): 865–76. doi:10.1007/s10439-008-9458-3. PMID 18266108. ↑ Semler, Eric J.; Lancin, Perry A.; Dasgupta, Anouska; Moghe, Prabhas V. (2005). "Engineering hepatocellular morphogenesis and function via ligand-presenting hydrogels with graded mechanical compliance". Biotechnology and Bioengineering. 89 (3): 296–307. doi:10.1002/bit.20328. PMID 15744840. ↑ Friedland, JC; Lee, MH; Boettiger, D (2009). "Mechanically activated integrin switch controls alpha5beta1 function". Science. 323 (5914): 642–4. doi:10.1126/science.1168441. PMID 19179533. ↑ Chan, CE; Odde, DJ (2008). "Traction dynamics of filopodia on compliant substrates". Science. 322 (5908): 1687–91. doi:10.1126/science.1163595. PMID 19074349. ↑ Dupont, Sirio; Morsut, Leonardo; Aragona, Mariaceleste; Enzo, Elena; Giulitti, Stefano; Cordenonsi, Michelangelo; Zanconato, Francesca; Le Digabel, Jimmy; Forcato, Mattia; Bicciato, Silvio; Elvassore, Nicola; Piccolo, Stefano (2011). "Role of YAP/TAZ in mechanotransduction". Nature. 474 (7350): 179–83. doi:10.1038/nature10137. PMID 21654799. ↑ "drug discovery@nature.com". Nature.com. Retrieved 2013-03-26. ↑ Duell, BL; Cripps, AW; Schembri, MA; Ulett, GC (2011). "Epithelial cell coculture models for studying infectious diseases: Benefits and limitations". Journal of biomedicine & biotechnology. 2011: 852419. doi:10.1155/2011/852419. PMC 3189631 . PMID 22007147. ↑ Barrila, Jennifer; Radtke, Andrea L.; Crabbé, Aurélie; Sarker, Shameema F.; Herbst-Kralovetz, Melissa M.; Ott, C. Mark; Nickerson, Cheryl A. (2010). "Organotypic 3D cell culture models: Using the rotating wall vessel to study host–pathogen interactions". Nature Reviews Microbiology. 8 (11): 791–801. doi:10.1038/nrmicro2423. PMID 20948552. ↑ Derosa, Maria C.; Monreal, Carlos; Schnitzer, Morris; Walsh, Ryan; Sultan, Yasir (2010). "Nanotechnology in fertilizers". Nature Nanotechnology. 5 (2): 91. doi:10.1038/nnano.2010.2. PMID 20130583. ↑ Hsiao, Amy Y.; Tung, Yi-Chung; Qu, Xianggui; Patel, Lalit R.; Pienta, Kenneth J.; Takayama, Shuichi (2012). "384 hanging drop arrays give excellent Z-factors and allow versatile formation of co-culture spheroids". Biotechnology and Bioengineering. 109 (5): 1293–304. doi:10.1002/bit.24399. PMC 3306496 . PMID 22161651. ↑ Reuters (2006-01-26). "Quickie Bird Flu Vaccine Created". Wired. Wired.com. Retrieved 2010-01-31. ↑ Gao W; Soloff AC; Lu X; Montecalvo A; Nguyen DC; Matsuoka Y; Robbins PD; Swayne DE; Donis RO; Katz JM; Barratt-Boyes SM; Gambotto A. (February 2006). "Protection of mice and poultry from lethal H5N1 avian influenza virus through adenovirus-based immunization". Journal of Virology. United States: American Society for Microbiology. 80 (4): 1959–1964. doi:10.1128/JVI.80.4.1959-1964.2006. ISSN 0022-538X. PMC 1367171 . PMID 16439551. Retrieved 2010-01-31. ↑ Hunt, P; Robertson, D; Weiss, D; Rennick, D; Lee, F; Witte, ON (1987). "A single bone marrow-derived stromal cell type supports the in vitro growth of early lymphoid and myeloid cells". Cell. 48 (6): 997–1007. doi:10.1016/0092-8674(87)90708-2. PMID 2435412. ↑ Van Den Berg-Bakker, CA; Hagemeijer, A; Franken-Postma, EM; Smit, VT; Kuppen, PJ; Van Ravenswaay Claasen, HH; Cornelisse, CJ; Schrier, PI (1993). "Establishment and characterization of 7 ovarian carcinoma cell lines and one granulosa tumor cell line: Growth features and cytogenetics". International Journal of Cancer. Journal International Du Cancer. 53 (4): 613–20. doi:10.1002/ijc.2910530415. PMID 8436435. ↑ Lee, YG; Korenchuk, S; Lehr, J; Whitney, S; Vessela, R; Pienta, KJ (2001). "Establishment and characterization of a new human prostatic cancer cell line: DuCaP". In vivo (Athens, Greece). 15 (2): 157–62. PMID 11317521. ↑ Ou, Dawei; Mitchell, Leslie Ann; Décarie, Diane; Tingle, Aubrey J; Nepom, Gerald T (1998). "Promiscuous T-Cell Recognition of a Rubella Capsid Protein Epitope Restricted by DRB1*0403 and DRB1*0901 Molecules Sharing an HLA DR Supertype". Human Immunology. 59 (3): 149–57. doi:10.1016/S0198-8859(98)00006-8. PMID 9548074. MacLeod, R. A. F.; Dirks, Wilhelm G.; Matsuo, Yoshinobu; Kaufmann, Maren; Milch, Herbert; Drexler, Hans G. (1999). "Widespread intraspecies cross-contamination of human tumour cell lines". International Journal of Cancer. 83 (4): 555–563. doi:10.1002/(SICI)1097-0215(19991112)83:4<555::AID-IJC19>3.0.CO;2-2. PMID 10508494. Masters, John R. (2002). 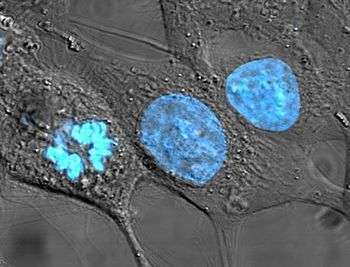 "HeLa cells 50 years on: the good, the bad and the ugly". Nature Reviews Cancer. 2 (4): 315–319. doi:10.1038/nrc775. PMID 12001993. Recently invented was the 3D Petri dish, the first 3D cell culture offering. Witkowski, Jan A. (2012). "Experimental pathology and the origins of tissue culture: Leo Loeb's contribution". Medical History. 27 (3): 269–88. doi:10.1017/S0025727300042964. PMC 1139336 . PMID 6353093. Pacey, Laura; Stead, Shelley; Gleave, Jacqueline; Tomczyk, Kasia; Doering, Laurie (2006). "Neural Stem Cell Culture: Neurosphere generation, microscopical analysis and cryopreservation". Protocol Exchange. doi:10.1038/nprot.2006.215. Gilabert, Juan A.; Montalvo, Gema B.; Artalejo, Antonio R. (2006). "Rat Chromaffin cells primary cultures: Standardization and quality assessment for single-cell assays". Protocol Exchange. doi:10.1038/nprot.2006.294.